Just a few pics from the opening night of Maui Open Studios 2012, held at the Maui Tropical Plantation, Wailuku, Saturday, February 4th. Everyone else was taking lots of photos, but I was more interested in the difficulties some of my artist friends were having in properly displaying their work. The lighting wasn't great, and no one there seemed to know how to turn the individual overhead lights. Pamela Neswald was standing in front of her painting, aiming a light that she had borrowed from artist Michi Itami. We were trying to figure out who to talk with to turn the overhead light on above her display. My husband snagged a volunteer who was going to look into it, but he couldn't figure out where the switches were. Eventually Pam borrowed some tape to attach the light to a nearby pole. That was a good partial solution, allowing some light on her larger painting, although it still left some of her other paintings in the dark. Michi Itami's display at the opening event. Michi's brilliant husband made portable spotlights for her, using triangle shaped pieces of wood and battery operated closet lights. I loved Michi's display - it was brilliant, since she placed a table in front of her painting. Her architect husband made two triangle shaped wood blocks, and then affixed battery operated closet lights so that the lights aimed upward at the painting. The picture above isn't the clearest, but you can see the two round lights angled toward the painting. Dim light in this photo . I didn't use any flash. The room was brighter than this of course, but the lighting in this photo is about equivalent to the lighting over many of the artists' displays, including quite a few friends of mine. Having a table in front of the painting is a great idea, and having more portable, battery operated lights and duct tape, etc, would be recommended for anyone doing this next year. There were pupus and appetizers available, like egg rolls and manapua (steamed buns with pork/veggie filling) for about $8. The main reason DH and I went to the event was to support some of the artists we knew and to get a copy of the guidebook, which was extremely helpful last year. Most of the artists in the event last year didn't have extra guidebooks, and we had missed the opening reception, but I did get a guidebook from artist Marilyn Jansen. Hard to see in this photo but on the table, the glistening packages are full of marshmallows and the boxes are graham crackers! I have to say, artists are pretty creative. Some of them came prepared with packages of marshmallows, graham crackers, chocolate. Others had gathered sticks, and at the outdoor fire, were making their own s'mores and roasting marshmallows. Roasting marshmallows and making smores at the Maui Open Studios Opening Event Party! In the guidebook are helpful descriptions, maps and routes for visiting various artist studios. The first weekend is now, 2/11 and 2/12, for Kihei and Lahaina. Next weekend - 2/18 and 2/19 - focus on upcountry and central Maui. The last weekend, 2/25 and 2/26, showcases artists in Hana. 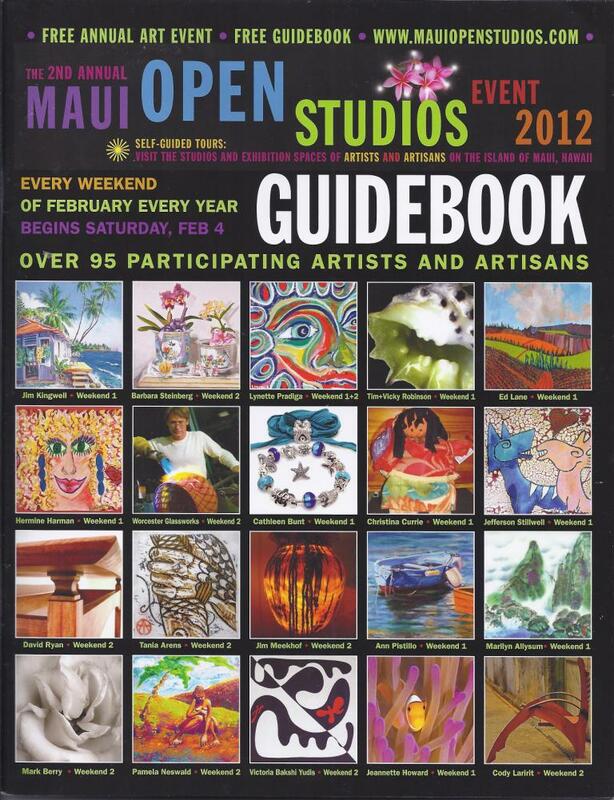 More information at www.mauiopenstudios.com.